The stimulations of the senses succeed one another with such rapidity that there is no room left behind them for even the slightest contemplation. This ancient desire for narrative still orders modern society: it animates the most complex, and most secret, of social movements. But the conditions of this desire’s satisfaction have been radically transformed; it has become the object of a global industry. This is the state through which we enter the work of Victoria Fu. Engaging and blending analog and digital processes, she creates films, videos and photographs that examine cinematic narrative and fragmented digital space. 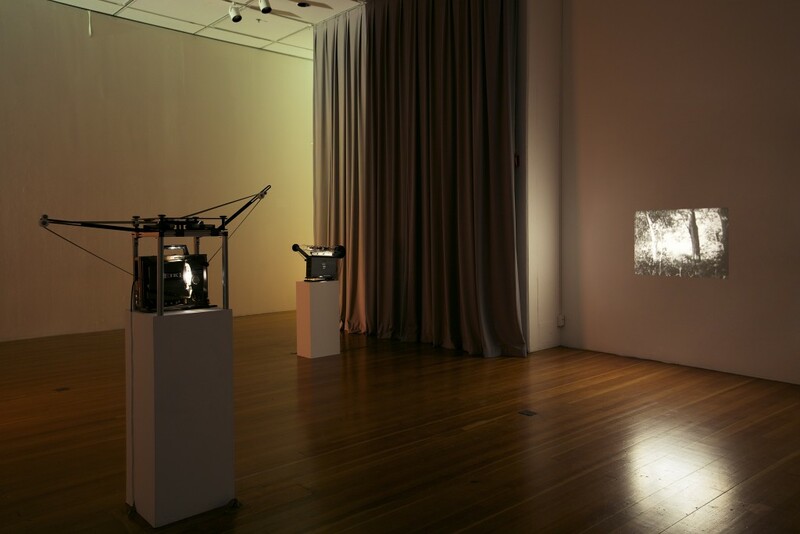 For example, the short, black-and-white, 16mm film Milk of the Eye (2012) is shown through an outmoded film projector. The lights are turned down and our first engagement with the work is through the persistent strumming of the projector that sits on a waist-high pedestal. Almost like an automatic weapon, the sound persists rapidly, stubbornly imposing a soundtrack on a film that is supposed to be silent. 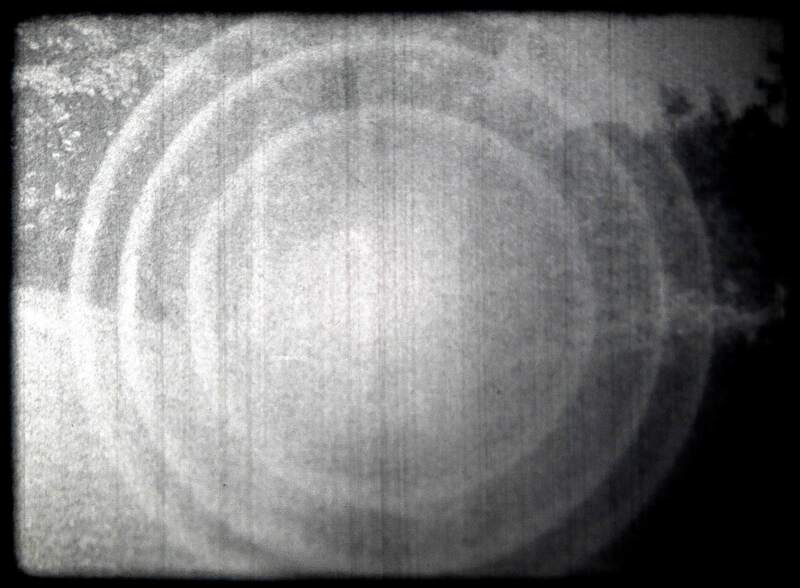 The bulb within the apparatus shines through the film reel, and slowly, a black-and-white image fades into focus on the wall before the projector. A figure is standing in a grassy landscape with a dirt path winding through it. The figure is a woman; leisurely she walks toward the camera, holding a mirror. She waves this strange tool from side to side, the sun is reflected off its surface, illuminating and obscuring the camera’s eye repeatedly. Multiple shots show her walking through trees, woods, and grassy plains, waving and wandering with no clear purpose. Finally she stands before the camera, mirror at her chest, and simply disappears. The sound endures but the image is gone until the film starts all over again. 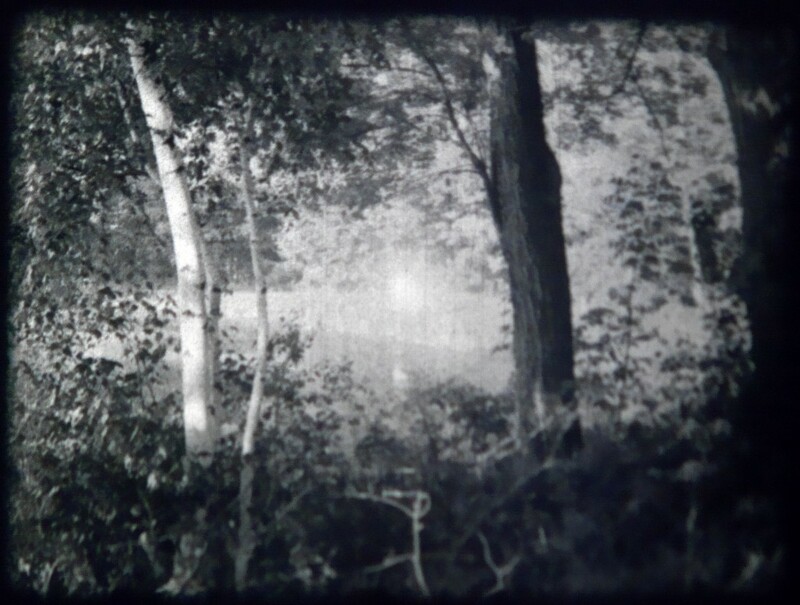 Still image from Milk of the Eye, 2012, black and white 16mm film loop. Courtesy of the artist and Samsøn. Photo: Stewart Clements. Running on an approximately four-minute loop, the black-and-white film and the apparatus on which it is presented recalls a time past when spectacular films were an escape. Yet, the work resists this; the images that flash before us are disjointed, fragmented, and offer no narrative structure in which to get lost. The blinding light of the mirror obscures not only the film frame, but also our ability to piece together a moment of distraction. This overall feeling of a disconnected narrative is echoed in Fu’s Belle Captive series of video installations. Belle Captive I (2013) is projected on a freestanding wall from an overhead digital projector. The space it occupies, like Milk of the Eye, is dark, but the images that appear before us are much larger, bleeding off the surface of the wall and onto the back of the gallery. What follows is a series of uncanny images and sounds against a flat yet colorful background in which hues blur into one another, much like a sunset. We see the top half of a boy’s face, the spinning head of a Roman statue, a woman sipping water, a small girl wearing a backpack and waving. Much like the images we see on our computer screens, these bodies and objects pop in and out of focus, moving across the projected surface to a series of familiar, yet untraceable sounds: ice clinking in a glass, low voices in muffled conversation, the ambient noises of a rainforest, the clicking and clacking of a computer keyboard and mouse. Again the video is on a short loop, approximately six minutes long, but unlike the work before, the images are large, colorful, and appear to be entirely digital. The people and objects in the foreground are all appropriated stock footage taken from the Internet, but the spectrum of color they are superimposed atop is originally shot on 16mm film then later transferred to digital. Blending together these processes, the work is at once cinematic and commercial, analog and digital, physical and virtual. Although completely different in the process and materials used, both the Belle Captive series and Milk of the Eye present fragmented images that disrupt traditional cinematic narrative. 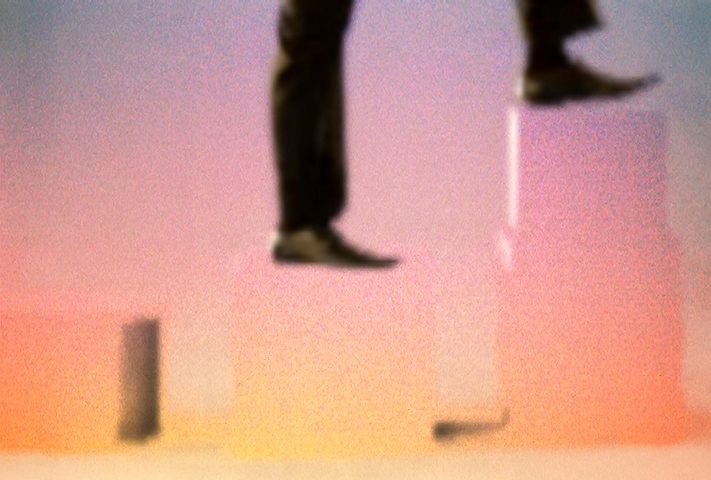 Still image from Belle Captive II, 2013, digital video with sound. Courtesy of the artist and Emerson Dorsch. Moving from the photographic frames on a film reel to endlessly reproduced virtual stock images, we find Kracauer’s and Stiegler’s anxieties being played out in this constellation of Fu’s work. While Kracauer is suspicious of cinema’s role in distraction, Stiegler is sure our current virtual climate is catastrophic, not only because of the adoption of media devices for marketing, but through the very transformation of the material we call “film.” In a reflection on cinema’s change from analog to digital, filmmaker and theorist Babette Mangolte suggests that the very shift from silver-based stills moving through a projector to algorithms and pixels alters the way we view and interact with film. 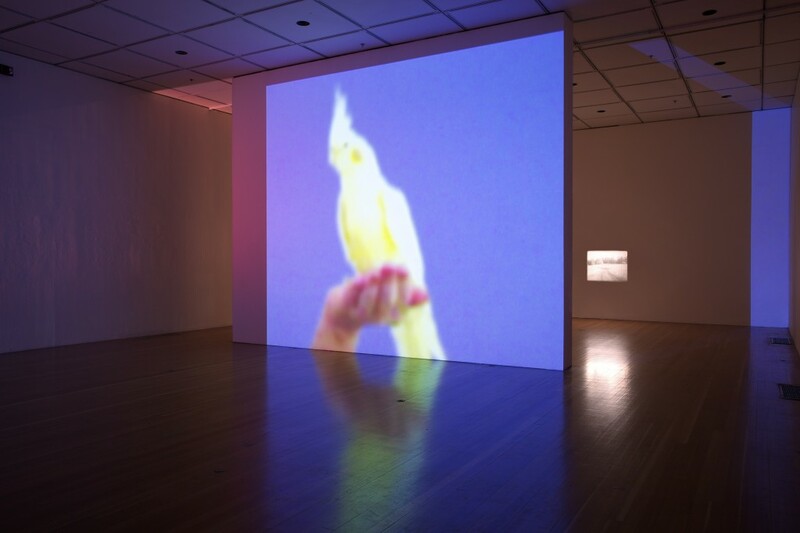 She posits that the clarity of the digital image, which comes from newer modes of filmmaking and media, creates viewers less likely to question what is being presented to them and more receptive to media influence: “It seems that sharpness could prevent one from ‘freeing the mind from its desire to concentrate.’” These crisp images, like glossy advertisements in a magazine, entice the viewer with their luster and allow no room for questioning or studied contemplation. As Fu’s work constantly applies and merges analog and digital processes, we can locate the nuances Mangolte defines in these two types of images – demonstrating how these slight aesthetic transformations have changed Kracauer’s distrust into Stiegler’s fear. Standing amidst these seemingly disparate works, we find that our anxieties over technology and media spectacles are not unique to this generation. Rather, they are imbedded within the history of film itself. The movement and grainy stills of Fu’s Milk of the Eye, alongside the glossy, slick images in the Belle Captive series, offer us an historical bridge to consider our relationship to this medium. In rethinking narrative, the materiality of film and its consumption, these works question both the history of distraction and the socio-economic regimes that made them necessary. 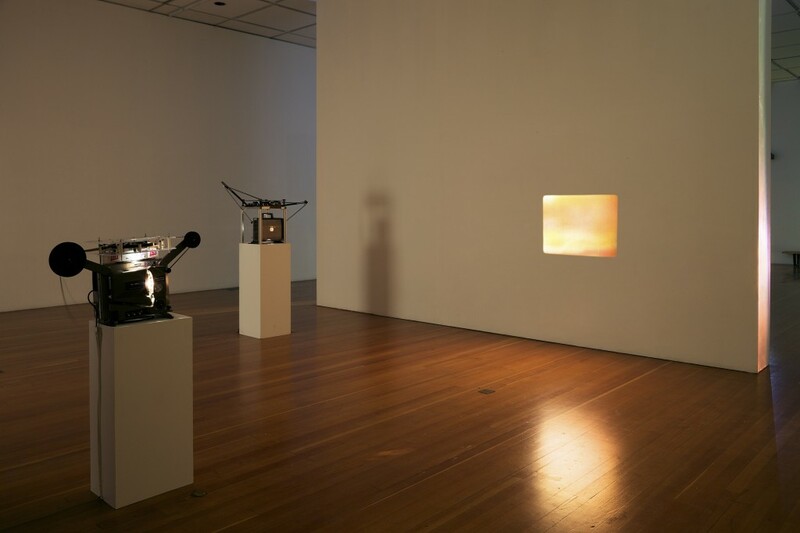 Through these films and video installations we can thus begin to examine changing modes of distraction, and how we choose to defy or comply with the system. Siegfried Kracauer, “Cult of Distraction,” in The Mass Ornament, ed. Thomas Y. Levin (Cambridge: Harvard University Press, 1995), 326. Bernard Stiegler, Technics and Time 3: Cinematic Time and the Question of Malaise, trans. Stephen Barker (Stanford: Stanford University Press, 2011), 8. Babette Mangolte, “Afterward: A Matter of Time,” in Camera Obscura, Camera Lucida, ed. Richard Allen and Malcolm Turvey (Amsterdam: Amsterdam University Press, 2003), 266.